China Stories: SRIRACHA SRIRACHA SRIRACHA! The stories behind Everyone's favorite Asian Sauce! Does it go well with EVERYTHING? SRIRACHA SRIRACHA SRIRACHA! The stories behind Everyone's favorite Asian Sauce! Does it go well with EVERYTHING? In our latest edition of HYPEBEAST PROCESS, CEO and founder of Huy Fong Foods, David Tran, walks us through the whole process of the iconic condiment's lifespan, from inception of idea to execution of product. David started the company in 1980 by hand packing the infamous sauce by hand with a miniature spoon, sourcing only the freshest ingredients to be sure that the element of spice was just right. Now, 35 years later, the only thing that has changed is the process of manufacture, with the quality and origin of Sriracha chillies remaining the same. Quality control is of utmost importance to David with an idealistic business projection to make the sauce spicier in the future. Every detail is painstakingly monitored, even down to the ingenious packaging whereby the color of the lid serves a significant purpose. David Tran says Sriracha can be used on any food so squeeze some onto your breakfast/lunch/dinner and enjoy the video above. Forget ketchup and mustard -- Sriracha might be the world's new favorite condiment. Beloved by millions for its unique spicy, garlicky, slightly sweet flavor, the chemistry of "rooster sauce" is the focus of our latest video. 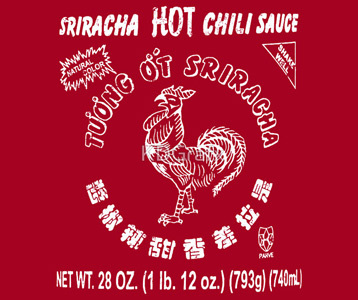 Does everything taste better with Sriracha? We do a taste test challenge to find out! GMM 381!